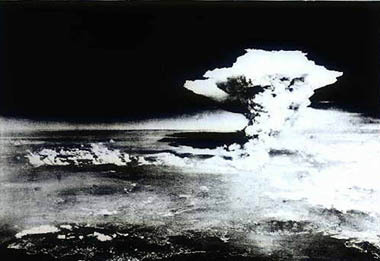 Around 1945, American planes were flying over Japan dropping bombs on cities. These were air raids. 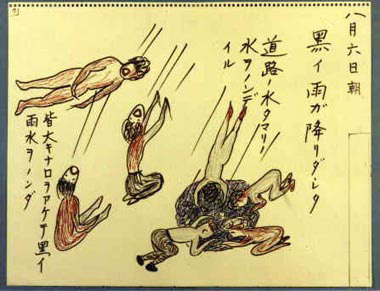 American planes sometimes flew over Hiroshima, setting off sirens and sending people fleeing to air-raid shelters. On the morning of August 6, air-raid sirens sounded just after 7:00 a.m. After a while, the all-clear sounded, and people began to move about their daily lives again. 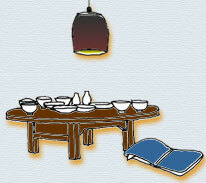 Sadako, her grandmother, her mother, and brother Masahiro were eating breakfast together. A blinding flash, then a thunderous blast attacked the family. The walls of the house toppled, and Sadako and the others were thrown. Masahiro and grandmother were injured but, miraculously, Sadako and her mother were unharmed. Somehow, all escaped from the collapsed house and fled toward the river. Along the way, Sadako's grandmother turned back to get something from the house. She was never seen again. Fires were igniting here and there. Someone helped the family into a small, decrepit boat to save them from the fires. Though only four at the time, Masahiro remembers desperately bailing water. While the family was on the boat, rain began to fall. The rain left black splotches on Sadako's clothes. For the past month, the Army Hospital patients and staff, including Father Shigeo, had been evacuated to Miyoshi City in north Hiroshima Prefecture. After the bombing, Shigeo returned to Hiroshima as a rescue squad member, erecting tents and helping the injured. On the 9th, Shigeo finally had the chance to return to his burned home, where he learned that his mother was dead.